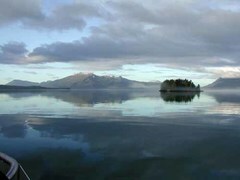 It was a typical July day in Southeast Alaska with light winds, a high overcast, and current against us as we left Auke Bay Harbor (just north of Juneau) on a trip to Petersburg. 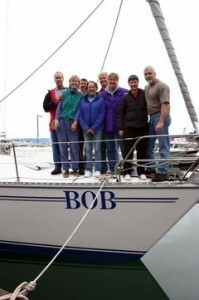 Most of the people we sail with have been on the Bob before—in this case, Al has probably sailed with us seven or eight times, Linda three or four, Wally and Sandy twice, and Mark and Gail were our Cheechakoes (Alaskan Greenhorns). With several hours of daylight left, we anchored at the entrance to the bay to try to catch a halibut. The fishing wasn’t red hot but we caught a few sculpin and a couple of small flounder before Al displayed his extensive Alaska experience by hauling in a halibut. Not to be outdone, Gail then hooked into a nice 20-pound halibut. In deference to Al, we have chosen not to show a photo of his fish. 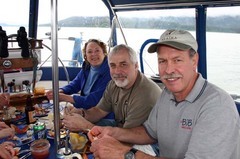 With fresh halibut in the cooler for dinner, we motored ten minutes up to the head of the bay for our evening’s anchorage. Two brown bear were grazing in the flats ahead of us and Al took those of the crew interested for a skiff run in for a closer look. Another magical overcast day greeted us as we continued south in Stephens Passage. The clouds continually changed shapes as they wrapped themselves around the mountain peaks lining the sides of the passage. Miniature spouts in the distance announced the presence of humpback whales, but we continued on our way to Holkham Bay. 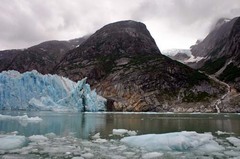 As we neared Harbor Island, we could see vibrant blue icebergs that had escaped from Tracy Arm and were drifting with the tide in Stephens Passage. Lunch was served at anchor just outside the entrance to Endicott Arm, a beautiful 28-mile fjord where we planned to spend the next couple of days. 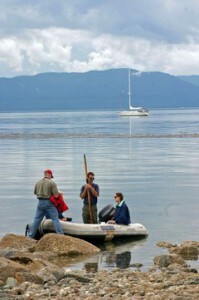 After lunch everyone went ashore for a hike along Wood Spit. 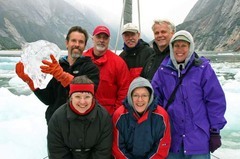 The experienced members of the crew arrived in Juneau with their rubber boots as recommended on the packing list. One of the Cheechakoes had read the list and decided that boots were not necessary and took up too much room in her bag. Luckily, Husband Mark was there for her with a strong back. 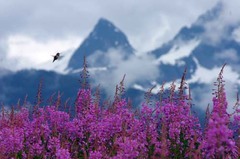 Fireweed on Wood Spit with Sumdum Glacier in the background proved to be a popular spot with both our crew and the Rufus hummingbirds feeding there. Wood Spit is the old terminal moraine of the Dawes Glacier that carved out Endicott Arm. As the glacier retreated, the pile of rocks and gravel that had been bulldozed ahead of the glacier’s snout was left behind to form the spit. Huge flocks of surf scoters took to the air as we approached, their wings causing the air to whistle through their feathers in the silence of the bay. Bald eagles soared overhead and we found two eagle nests in the trees at the water’s edge. Brilliantly marked harlequin ducks sat on rocks and swam in large flocks through the eddies of the current rushing over the shallow entrance to Endicott Arm. The tide was coming in, so we upped anchor to catch the flood into Endicott Arm. We anchored for the evening at an un-named spot on the north shore. A huge waterfall came from the peaks above us and drained into a good-sized river. A large brown bear with a reddish coat wandered out of the tall grass ashore and we watched him feed for an hour or so before dinner. This morning, a brown bear with a blonde coat appeared in the same area where we had watched the cinnamon colored bear the night before. Everyone brought their breakfast up to the deck for an hour’s worth of bear watching. Then, with a favorable tide we motored further into the arm, anchoring for lunch in the green tinted glacial water at the entrance to Ford’s Terror. After a leisurely lunch, we continued up Endicott Arm. More and more icebergs appeared until the water was so full of them we had to slow the boat to work our way between them. 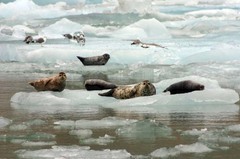 A small bay on the north side of Endicott provided an ice-free spot to spend the night. Waterfalls surrounded us and one of the biggest black bears I’ve ever seen spent the evening grazing on the grassy flats near the river. The river was fed by a huge cataract that looked like a snow bank, until a close look with binoculars revealed that it was indeed running water. 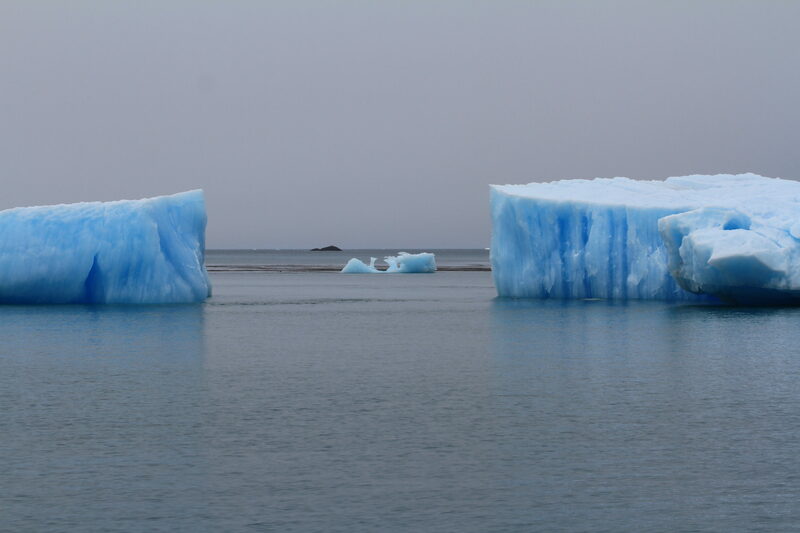 The current from the river kept the dense mix of icebergs from entering the anchorage and banging against our hull. Most of the day was spent watching icebergs calve off of the Dawes Glacier at the head of Endicott Arm. The ice was very thick on the run up to the glacier so we had to slow down to a crawl to push our way through. The icebergs calve off the face of the glacier with a sound like an explosion or the crack of thunder. The berg crashes into the water, throwing up a huge spray of water and sending out a wave that, depending on the size of the iceberg, sometimes causes the boat to rock back and forth. Incredible rock peaks surrounded us with the snouts of retreating glaciers poking out of each valley along the side of the arm. We were reluctant to leave—always wanting to stay for one more calving, but we had to get under way so we would arrive at Ford’s Terror close to slack water. The evening’s anchorage was inside Ford’s Terror. The entrance to the anchorage is very shallow and narrow. So much water runs in and out of the large bay that the entrance can only be safely transited at high slack water. We shot through the narrow entrance on the tail end of the flood, surrounded by beautiful rock walls and waterfalls. Although it was incredibly scenic, it’s easy to understand how Ford’s Terror got its name. Another large waterfall at the head of the bay marked our anchorage and when the engine was shut off, we were alone in the bay, surrounded by majestic rock mountains and the sound of too many waterfalls to count. This was a leisurely day—once inside the bay, we could only exit on the next high slack tide. It was a beautiful spot for a day of rest and introspection. There was a tour of the bay in the skiff for those who had the energy. As usual, the wildlife provided plenty of entertainment. We watched a black bear sow and cub leisurely work their way around the edge of the bay, poking under rocks and occasionally scraping a mouthful of barnacles off a large boulder. The pair suddenly disappeared and as we searched for them, the reason for their abrupt departure, a large black bear boar, came out of the brush not far from where the sow and cub had been feeding. A total of eight black bear were sighted during the day. An early turkey dinner with all the trimmings put us all in a holiday mood. The trip out the bay was just as scenic as on our arrival 24 hours earlier. We exited the narrows just before the high slack tide, anchoring outside the entrance in the still green water. A clear blue sky greeted us the next morning for our trip out of Endicott Arm. As we continued south in Stephens Passage, spouts of vapor hung in the still air marking our return to whale waters. 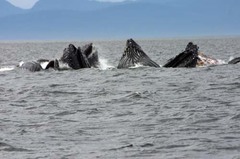 Humpbacks were spread out all around us as we motored through the mirror smooth water. We anchored for the night in a little bight in the Brothers Islands, enjoying the late afternoon sunshine. As a change of pace, we had a Mexican dinner of halibut tacos. The margaritas weren’t bad either! A nearby Steller sea lion rookery provided an unusual serenade for the night, similar to being in a ward for those in gastric distress. A humpback whale came into our little bight this morning, waking us with the sound of his spout—a great way to start the day! We visited the nearby rookery, where the beach was covered with Stellar sea lions. The males were busy defending their harems. A large male can weigh up to 2,000 pounds so the younger males generally keep their distance. Pybus Bay was only an hour away, so we cruised over that way continuing our whale watch. Outside the bay we anchored again and caught a halibut to have for dinner before motoring in to Cannery Cove. While we were at anchor, we saw four different brown bears working their way around the salmon-filled stream coming into the head of the bay. Morning brought us a nice rainbow as we had breakfast and watched for bears. 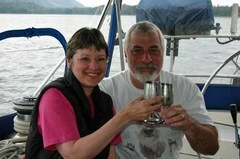 After an hour with no sign of any bears, we readied the cabin for our departure and brought the anchor aboard. Just as we started out of the cove, a sow and two cubs appeared at the stream so we turned back for a closer look. The three bears crossed the stream and were busy chasing salmon when a large boar eased out of the grass across from the first bears. The sow gave a bark and the two cubs high-tailed it up the bank and disappeared into the tall grass. The sow continued to bare her teeth at the boar and charged towards him several times, splashing into the water before pulling up short. The boar calmly meandered towards the stream, ignoring all the growls and splashing. The sow finally turned and ran off in the direction her cubs had disappeared when the boar got to the stream. The big male didn’t seem to be too concerned about the ruckus. With the bear show over, we motored out into Frederick Sound and found a nice northerly breeze. 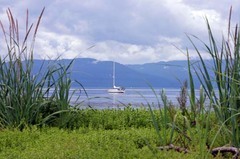 The sails were soon up and we close reached up the northern shore of Kupreanof Island. 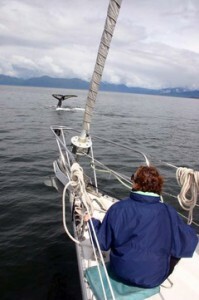 There we found several humpbacks bubble netting and rolled up the jib. As the whales were headed east (the direction we wanted to go) we followed along under mainsail alone as the humpbacks worked their way along the shore. Portage Bay gave us a nice spot to get out of the wind and anchor for the night. 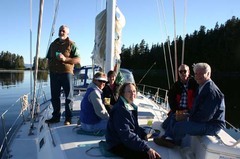 Everyone decided to go ashore and stretch their legs on the logging road that ran along the edge of the bay. Jen and I stayed on board to get dinner ready. When the hikers returned, we had cocktail hour and a celebration of Al and Linda’s anniversary. Drizzle greeted those of us who got up early the next morning. 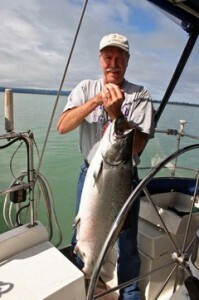 We had decided to try a little salmon fishing, so those who wanted slept in, while a few of us got the boat underway. As soon as we got back into Frederick Sound, we slowed to trolling speed and dropped a couple of lines in. I was not too optimistic, as the salmon fishing had been pretty slow for us earlier in the trip. Boy was I wrong—we had 10 kings on in the next two hours! We released most of them, but when Wally saw the 42-pound monster that he had been battling for 20 minutes, he decided to keep that one for dinner. The clouds cleared off to reveal a beautiful blue sky. We continued on, crossing Frederick Sound and entering the buoyed channel into Thomas Bay. An hour later we were anchored in front of the waterfall at Cascade Creek and the skiff was headed for shore with an enthusiastic bunch of hikers. The Cascade Creek trail is one of the most beautiful hikes in Southeast Alaska, passing an impressive waterfall before entering the forest and following a series of cascades as the river flows down a steep rocky gorge. When everyone returned to the boat, we headed to the outer part of the bay to shorten the run to Petersburg the next day. 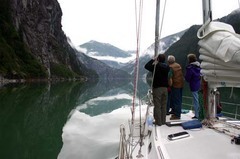 A protected little bight provided a serene anchorage and we enjoyed a peaceful evening on the calm glacially tinted water. Fresh King salmon fillets were soon ready on the grill for our final dinner of the trip. The two hour run to Petersburg passed quickly in a frenzy of showering, packing, and last minute organization. 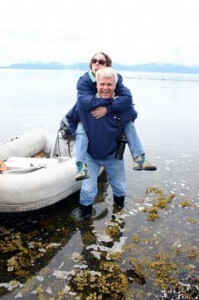 We entered the northern end of Wrangell Narrows and got a boost from the current as the tide was rushing in. We passed the bustling canneries on Petersburg’s waterfront as we made our way to the fuel dock to top up the tanks for the next cruise. With that accomplished we headed for our temporary slip in the south harbor. Once the boat was secured to the dock, there was time for a quick tour of town before the taxi came to everyone to the airport for their return home.